When it comes to examining the lifestyles of groups of animals, sleeping habits are a good place to start. Some animals conduct all of their business when it's light out, and others prefer the darkness of the night. Kookaburras are kingfishers that, like most people, are nocturnal in their sleeping habits. 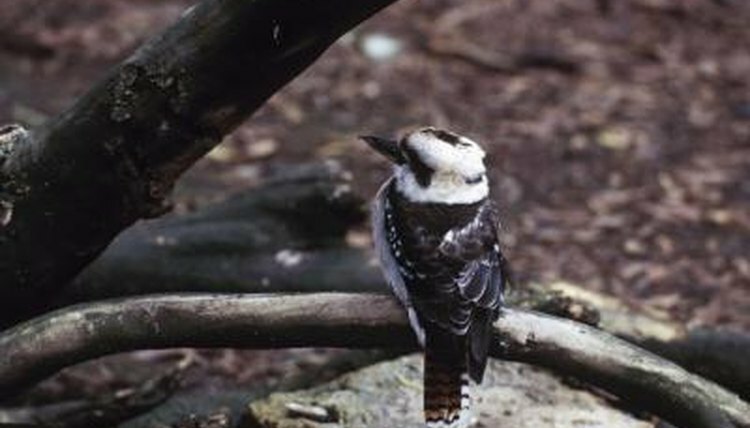 The kookaburra world consists of four species, all from the genus Dacelo. These species are the laughing kookaburra (Dacelo novaeguineae), spangled kookaburra (Dacelo tyro), rufous-bellied kookaburra (Dacelo gaudichaud) and blue-winged kookaburra (Dacelo leachii). These sizable birds come from both New Guinea and Australia. As carnivorous creatures, kookaburras feed on a lot of rodents, fish, reptiles, bugs and tiny birds. Some of them are even so companionable that they readily take food from people. Despite that, humans are often urged against feeding them. Many of the foods offered by people don't provide kookaburras with the proper nourishment they need, after all. Migration is not a part of the kookaburra lifestyle. In terms of habitat, they are prevalent everywhere from agricultural sites to outskirts of forests. Since kookaburras across the board are diurnal birds, they sleep during the night and go about the bulk of their business during the daytime. Roosting generally lasts for roughly 12 hours or so each night. They are at their noisiest right as it begins to get light out, usually around daybreak. They sometimes start calling well before that time, as well. Their dawn calling consists of lots of husky vocalizations, all in unison. Kookaburras roost alongside others of their social units. They all meet up around twilight each night. They sometimes congregate prior to twilight or right after it begins. Kookaburras usually have a handful of preferred trees for these purposes. The trees also serve as their meeting spots. Once they're all together, they all begin calling again. Youngsters don't always sleep alongside the mature members of their social units. It's relatively common for young kookaburras to have totally different roosting spots as well. Kookaburras often roost for lengthier periods in unpleasant weather conditions, whether excessively cold or damp. They often nestle together tightly as a means of keeping warm and comfortable.